My advanced cellphone: a cordless land line with a clip. Even with my feet firmly planted in Geezer-ville, I’m sure one day I will succumb to the need to be electronically leashed and connected to the entire planet, but for now I prefer conversation to texting, and eye contact to distraction. And if I may be totally candid, my frugality plays a role in the decision to be smartphone free. The idea of paying over one-thousand dollars a year for the privilege of being available 24/7 is as unpalatable to me as the cost of printer ink cartridges. In my defense, I do like some advancements. For instance, I found a solution for missing my landline calls when I’m out in the orchard or garden. 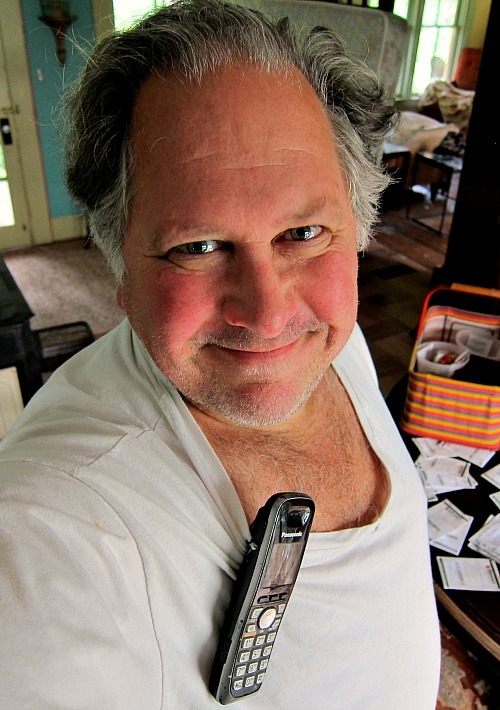 I secured a clip to my cordless phone, allowing it to affix nicely to my uniform du jour, a white v-neck t-shirt. I’ve quadrupled my range (when I remember to wear it). I’m now available all the way out to the pear trees, half way back to the greenhouse and comfortably lounging in my hammock (though bulldog snoring does cause me to repeat myself on occasion). By adding a pocket clip to my cordless phone, I’ve increased my reception range about 150 feet in each direction. Now that is progress (at least for me). And just in case you are wondering, yes, I do have electricity and indoor plumbing. You’re not alone. Hubby and I do not have a smart phone. I am intimidated by technology, not to mention the whole privacy issue. That said, we would sorta kinda like one–for our travels. Imagine being able to find a hotel when you’re out on the road. No having to find a restaurant with WiFi. Heavenly. But again, I am worried the phone will be smarter than me! Sue, I’m with you, I bet if I had more of a travel budget, I’d hop on the smartphone wagon ASAP! Hillarious – great photo too! I would have posted my reply via my smart phone, but I couldn’t find it. Maybe I need a cool clip like yours! Randy I count on you to keep me in the loop, so hang on to the smartphone (once you find it) and keep me posted if you think it’s time I enter this century. Gail, I like that “Last Holdouts.” I see a PBS special in the making, just hope they don’t play any Deliverance banjo music for the soundtrack. Tom, I’m so thrilled to know there are still a few of us left on the planet. The only time I use a cell phone is when I drive across country — road trips (Tracfone for emergencies). When I’m working, I’m glued to a phone and my computer 8 to 10 hours a day. And yeah, I have voice mail AND email. Then when I’m away from my desk and my computer — that’s exactly where I am, Away! And guess what happens when I get back? — There are voice mail messages and emails for me to read and reply to, and nothing awful happens either. It’s magic I tell you! And even though I work in a high-tech industry, I do not have to be connected every instant of the day and night. Living that way, to me, just sounds nuts. I ain’t gonna do it. I will never be one of those people having dinner at home or in a restaurant checking my email or responding to a ring or text. It also prevents me from walking into walls and poles because I can actually see things in front of me rather than relying on peripheral vision. The other nice thing is when someone speaks to me, I’m coherent enough to hear them, and not all wrapped up in this little tiny electronic device that seems to run too many people’s lives. So, here’s to the folks who know the world can get along without them for a few hours, or even days, or maybe even weeks! ps – the best thing ever invented was Hane’s and Fruit of the Loom, Men’s V-neck T-shirts. I just bought a new pack of 8 for $20. My last mobile lasted 7 years. After two months of recycling my kids’ older phones and friends offering to buy me a new state-of-the-art, my husband chucked a wobbly and bought me an I-phone behind my back. Ruddy turncoat. It all feels very wrong and impractical to upgrade so often. Such a waste. Jacqui, I promise to give you full credit, but “Ruddy Turncoat” will not die with this comment. I plan to use it early and often. Brilliant! June, that is as it should be, a beautifully undisturbed day on the Oregon coast, with the exception of a few pulses from a new and soon to be well-used cuisinart! Tom, We were given 2 iphones- old ones , which apparently serve no purpose but to clutter up drawers of the techies. My mother would be horrified. Heck, I’m horrified, what a waste. Anyhoo, they function as our computers now. Sandra, you are to be commended. Saved from the dusty recesses of the junk drawer! I don’t have a smartphone! I still have my old Nokia gsm that I use to phone & sms!